As 2017 comes to a close, we wanted to thank you all for your support and help in making this the best year for us yet! Over the course of the last year, we’ve successfully launched our online app, added better analysis tools for multi-family and commercial properties and made numerous other improvements to our analysis tools. To help you analyze investment properties faster, we are working on integrations with several property data providers, which will allow you to import property information, estimated value & rent, photos and sale history from public records. Instead of entering the property information manually, you’ll be able to quickly import most of it with a click of a button, customize just a few additional parameters and be on your way to analyzing this deal in seconds. We hope this feature will not only save you time and reduce manual data entry, but will also give you direct access to accurate home facts and information. One of the most requested features last year has been side by side property comparison and we will be working on adding this tool in the coming year. 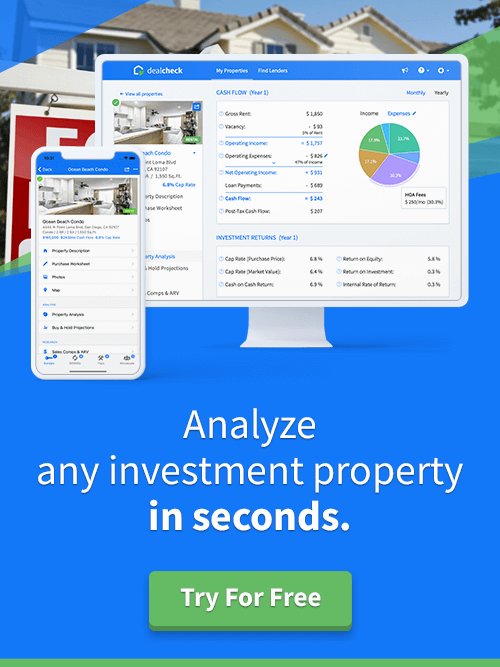 While DealCheck works great for quickly analyzing rental properties and flips, many investors want to compare the purchase costs, cash flow and investment returns of multiple properties side by side to help them pick the best deals. Our side by side comparison tool will help you do just that. We realize that having dozens of properties can make it challenging to find the ones you’re looking for. Some of our more active users have over 100 properties in their accounts! To solve this, we will be adding quick tagging (or in other words – folders), which will help separate your properties into different categories or portfolios. This will help you find the properties you’re interested in faster and will also enable us to add portfolio analysis down the road. On behalf of everybody at DealCheck, we wish you a Happy New Year and are looking forward to having you on board in 2018!